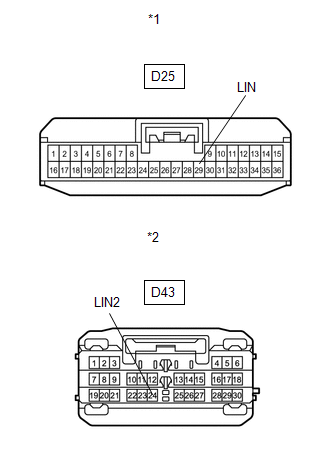 This DTC is stored when there is an open, short or ECU communication malfunction between the power management control ECU and certification ECU (smart key ECU assembly). There is an open, short or ECU communication malfunction between the power management control ECU and certification ECU (smart key ECU assembly). Check for certification ECU and power source control ECU DTCs. Only DTC B2287 is output. DTC B2287 and B2785 are output simultaneously. When DTC B2287 and B2785 are output simultaneously, perform troubleshooting for DTC B2785 first. (a) Disconnect the D25 and D43 ECU connectors. DTC B2287 is not output.